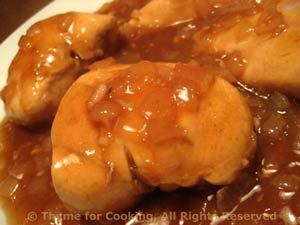 Chicken Breasts, braised in Red Wine, Vinegar, Thyme for Cooking recipes. 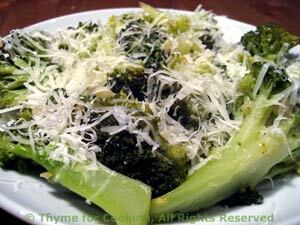 Watch the broccoli as it can go from perfect to over cooked and limp in a hurry. Remove it from heat as soon as it's done. It will be reheated when it's finished, so no need to keep it hot. Put broccoli in a steamer basket in a saucepan with an inch of water in the bottom. Put on medium heat and steam for 12 minutes or just until done. Remove broccoli and keep warm (not hot). In same pan heat the oil. Add garlic and sauté briefly. 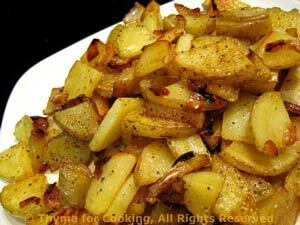 Put into a serving bowl, sprinkle with Parmesan and serve.